EwinRacing promises to repair or replace any EwinRacing product or component that is found to be defective in material or workmanship within five (5) years from the date of original purchase so long as you, the original purchaser, still owns it. EwinRacing further warrants the steel frame for a period of ten (10) years. This is your sole and exclusive remedy. This warranty is subject to the provisions below.This warranty is effective with purchases made on or after February 28, 2017. Purchases made before that date have a different warranty term, please consult your retailer. 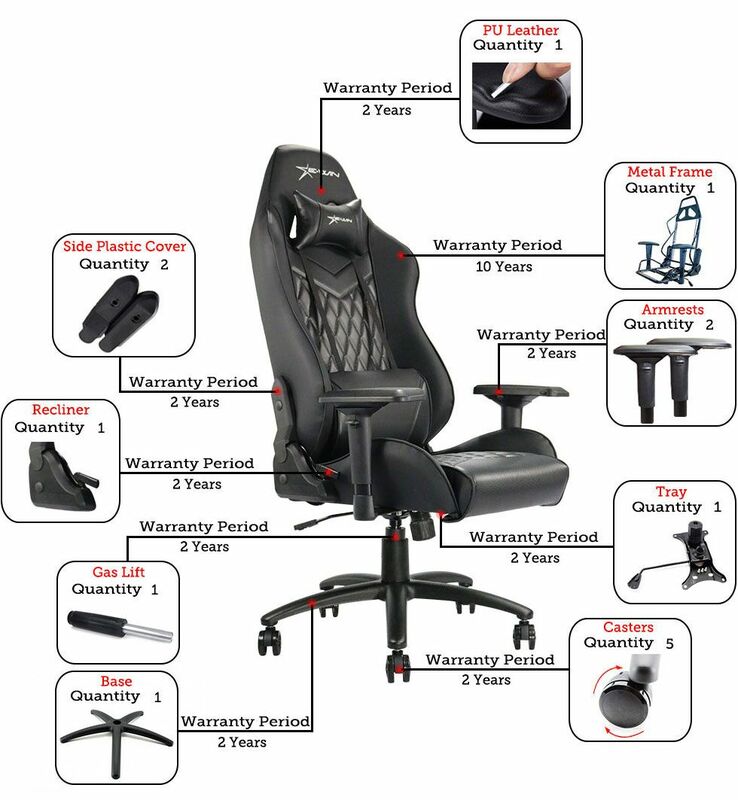 Modifications or attachments to the product that are not approved by EwinRacing. Damage caused by the carrier in-transit is handled under separate terms. Seating Usage: Normal commercial use for seating is identified as the equivalent of a single shift, forty- (40) hour workweek. To the extent that a seating product is used in a manner exceeding this, the applicable warranty period will be reduced in a pro-rata manner. EwinRacing does not warrant the color-fastness or matching of colors, grains, or textures of covering materials. TO THE EXTENT ALLOWED BY LAW, EwinRacing MAKES NO OTHER WARRANTY, EITHER EXPRESS OR IMPLIED, INCLUDING ANY WARRANTY OF MERCHANTABILITY OR FITNESS FOR A PARTICULAR PURPOSE. EwinRacing WILL NOT BE LIABLE FOR ANY CONSEQUENTIAL OR INCIDENTAL DAMAGES. Notice to purchasers for home or personal use: Federal law does not permit the exclusion of certain implied warranties for consumer products. Therefore, if you are purchasing this product for home or personal use, the exclusion of implied warranties noted in the above paragraph does not apply to you. Some states do not allow the exclusion or limitation of incidental or consequential damages, so the above limitation or exclusion may not apply to you. This warranty gives you specific legal rights, and you may also have other rights which vary from state to state.